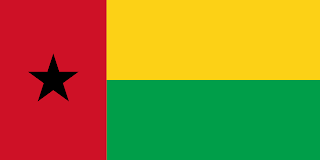 Guinea-Bissau is a small country on the West coast of Africa. Being a coastal country they eat a lot of fish so I picked this unusual burger recipe to try because I've never had a fish burger before. Put the fish in a bowl and add the salt & pepper. Next you want the juice and zest of the lemon. Mix it all together and leave for about 30 minutes. Roast the peanuts in a pan. Chop up the chillis and onion and place in a food processor along with the roasted peanuts. Cook the fish in the oil until it's just cooked. When the fish has cooled a bit but it in a bowl with the peanut mixture and the flour. Mix it well breaking the fish into small flakes. Cover with clingfilm and refridgerate for an hour. Heat some oil in a pan and form the mixture into patties. Fry the patties a few at a time until they're crispy on the outsides and browned.